I am enamored of cholla with their rugged beauty, shimmering spines, and breathtaking flowers and right now they are putting on a spectacular show in the front garden. For decades all jointed cactus were summarily lumped into one enormous genus, Opuntia. But not long ago, botanists woke up and realized there was a lot of variation in the group and began to split things up. 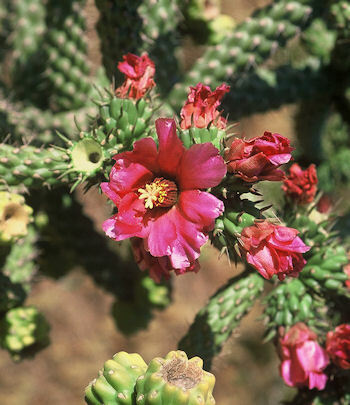 The result is that our friends the prickly pears, those with flat stems (pads) are still in Opuntia, but the ones with cylindrical stems now reside in the clumsily named genus, Cylindropuntia. We have five members of the gang in the front; the cane cholla (Cylindropuntia spinosior), what I think is buckhorn cholla (C. acanthocarpa), teddy bear cholla (C. bigelovii) and pencil cholla (C. aciculata). The cane cholla was here when we moved in over 20 years ago. It lives near the street, gets watered when we think about it or it rains and has the most spectacular flowers of them all. These blossoms are a deep, rich purple and in a kind of bonus round it retains its bright yellow fruit in long cascades for years. The buckhorn cholla come in two color forms, which is not at all uncommon this species. We inherited a nice orange one and soon found that our neighbor had one with a beautiful deep copper flower. So one year, we swapped and now each of us have big, robust plants that bloom extravagantly in both colors. Ours are along the driveway and make returning home at this time of year even more enticing. Our pencil cholla also lived here before us and when it came time to build the wall for the front patio, it presented a tricky problem. It was closer to the proposed wall but with judicious pruning, and great care, the wall got built. For many year, this cholla housed the detritus collected in the name of a home by a pack rat family. But they must have died out because they have been gone for a while now. It could be my favorite among favorites, with its slim stems, shrubby habit and odd, yellowish flowers rimmed with brown. There are two teddy bear cholla out front; one on the caliche ledge that separates us from our neighbor, and the other just beyond the west opening of the patio. The one on the far reaches of the front is in full bloom with its lime green flowers perched atop its chubby stems. The other is more typical of this species and never blooms but does glow daily in the rays of the setting sun. Both are gaily spreading a carpet of discarded stems along the ground at their feet to make the cholla forest I dream about as they take hold. I count on our cactus to mark the fading of spring to summer, marking one of the finest season of our year. And once again, those snarly but beloved cholla have no let me down. One of the things you have to accept about growing bulbs is that your reward, like the saint's, will be delayed. You purchase them as something that more closely resembles a desiccated puck, or something the dog left behind. You then plant this tidy packet in fall and watch while almost nothing happens for a couple of months. This is a gardening leap of faith, not unlike planting from seed, but the rewards are rolling in right now. The bulb blooming time is in full glory, and the rewards of those long ago plantings are stupendous and three of my particular favorites are showing off mightily. Aril bred iris are a complex group of hybrids that long ago won my heart with their astounding upright blooms in exotic blends of purple, brown, chartreuse and gold. I have never been particularly successful with the lovely bearded iris, my yard is too dry, I am too lazy, and they just don’t care much for the place. But these arilbreds love it here. Arilbreds demand a long, hot, dry summer - no trouble providing that. They thrive in most soils, including the rocky, barely amended slope, on which I have them planted. What could be easier? To top it off, even during their winter and spring growth spurt they do not have excessive water demands. I got my first arilbred years ago at an Iris Society sale and promptly lost the tag. I still don’t know its name, but it has never failed me and has gently increased over the years. Last fall I went over to Ardy Kary’s wonderful yard and bought six more varieties. All are thriving, but‘Walker Ross’ has already bloomed making me happy, happy, happy. The Freesia laxa has just begun to open its spray of sweet, white flowers. I grew this plant for sale at the DBG and was so fond of it I convinced a bulb loving friend to take some for his place. Then he regrettably died and I inherited or adopted a lot of his plants, one of which was a small cycad. Years pass, and I finally got around to planting the cycad up at the back porch and the very next spring, a shield of bright green leaves leapt up among its fronds. I had no idea what it was or where it came from - a common occurrence here - so I waited for results. Once it flowered, I was pleased to see my old pal the Freesia was back. That plant had waited either as seed or a bulb for a long time for good growing conditions and now each spring it jumps up to remind me of my long gone friend and the admirable habit of gardeners to give things to their friends. Homeria is a genus of bulbs from South Africa and ours came from a set Gary found at Home Depot years ago. There are two color forms, yellow and orange. We first planted them near the stairs where the Arilbreds now live. As they increased we moved them around the place and now there are three sets; yellow under the big mesquite, orange by the bauhinias, and the original group. I think of them as cheerful, bright, open, and they continue to increase and thrive whether I pay attention or not. And that is my greatest criteria for successful bulbs in my garden. They stay put, none of that lifting and chilling and treating; they come back year after year and bloom; and they like the conditions here without undue intervention on my part. To get the most variety in bulbs you have to go mail order and there are dozens of excellent sources both here and abroad. To see or find out more about all kinds of iris, visit Ardy Kary’s home in Arcadia (www.karyiris.com) this month to see what you are buying, or go to the Iris Show at Baker’s on Saturday, April 16. Sometimes things just work out. For years we imagined a desert perennial bed in the front of the house. At first it was supposed to be a elliptical thing and we installed irrigation lines to help it along. These first steps were modesty successful, but somehow it just never took off. The penstemon (Penstemon parryi) were fine, but everything else seemed to just take against the idea. The remainders of that initial effort are few, but exemplary: the astounding Menodora longiflora that flowers repeatedly throughout the hottest part of the summer, the rampant black dalea (Dalea frutescens) that has gone through numerous prunings and companions, and all of it is still backed up by a gorgeous pair of red fairyduster (Calliandra californica) that have been here almost as long as we have. For the next round, we shifted to less needy plants and the irrigation system was left to become an archaeologic relic underground. The palo blanco (Acacia willardiana) grew beautifully and so did a few agaves, particularly A. victoriae-reginae and A. titanota (that splendid one known as Felipe Otero). But all in all it was a vague mess. Ultimately, we built a short wall. It was an instant improvement, settling the area, making it look real and important. Someday we hoped would become a nice place to sit. A couple of years later Gary wrestled the remains of other projects, broken concrete and slabs of flagstone, into a charming, irregular patio that in effect created small beds in front of the fairydusters. Brittlebush (Encelia farinosa) threatened to take over, but we were ruthless and only let a few stay. A friend provided abundant penstemon seed and a small firecracker penstemon (Penstemon eatonii) which we nursed through the summer. A fall a visit to the nursery brought in a couple of Angelita daisy (Tetraneuris acaulis) and a pair of blackfoot daisy (Melampodium leucanthum). There has never been a need to plant moss verbena (Verbena pulchella) in this yard, and one bed was permitted to be be run with it. A nice blue pot was filled with a handsome Agave albomarginata and the place began to look pretty keen. Now it is spring, and all our long-held hope for this area are coming to pass. For such a long time it was merely the whisper of an idea and here it is, a full blown patio with color, birds especially hummers, and a sweet view of the buttes to the south. A little wine, a few friends, and a reliance on patience and the long view, and we finally have the desert perennial garden we imagined so long ago. It is the little perennial garden that could.